GitHub - janakerman/jest-snapshots: A project to support my blog post on Jest snapshots. The magic is in `src/components/Footer.spec.js`. A project to support my blog post on Jest snapshots. The magic is in `src/components/Footer.spec.js`. Want to be notified of new releases in janakerman/jest-snapshots? It also only works with npm 3 or higher. Now your editor should report the linting warnings. Note that even if you edit your .eslintrc file further, these changes will only affect the editor integration. They won’t affect the terminal and in-browser lint output. This is because Create React App intentionally provides a minimal set of rules that find common mistakes. If you want to enforce a coding style for your project, consider using Prettier instead of ESLint style rules. 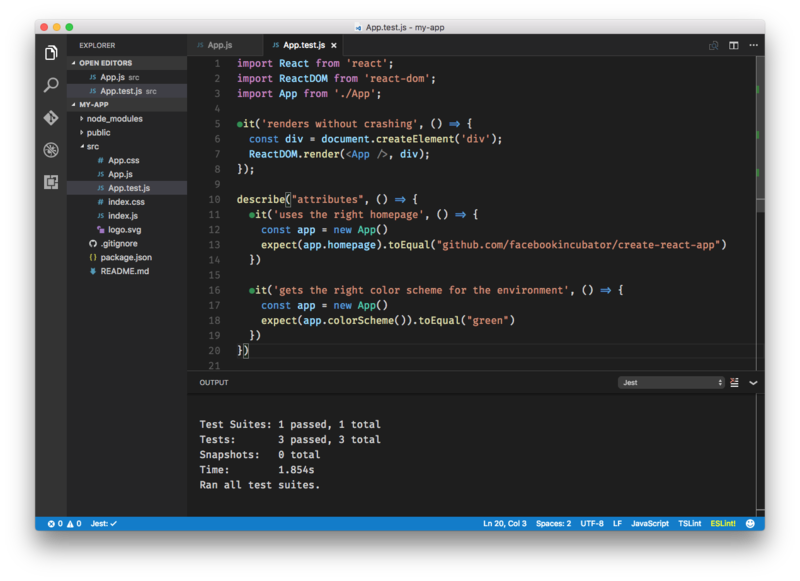 Visual Studio Code supports debugging out of the box with Create React App. This enables you as a developer to write and debug your React code without leaving the editor, and most importantly it enables you to have a continuous development workflow, where context switching is minimal, as you don’t have to switch between tools. Instead of downloading the entire app before users can use it, code splitting allows you to split your code into small chunks which you can then load on demand. This project setup supports code splitting via dynamic import(). Its proposal is in stage 3. The import() function-like form takes the module name as an argument and returns a Promise which always resolves to the namespace object of the module. This will make moduleA.js and all its unique dependencies as a separate chunk that only loads after the user clicks the 'Load' button. You can also use it with async / await syntax if you prefer it. To enable importing files without using relative paths, you can add the --include-path option to the command in package.json. Now running npm start and npm run build also builds Sass files. node-sass --watch has been reported to have performance issues in certain conditions when used in a virtual machine or with docker. node-sass-chokidar is used here as it addresses these issues. To reduce the number of requests to the server, importing images that are less than 10,000 bytes returns a data URI instead of a path. This applies to the following file extensions: bmp, gif, jpg, jpeg, and png. SVG files are excluded due to #1153. What other .env files are can be used? If the proxy option is not flexible enough for you, you can specify an object in the following form (in package.json). You may also specify any configuration value http-proxy-middleware or http-proxy supports. All requests matching this path will be proxies, no exceptions. This includes requests for text/html, which the standard proxy option does not proxy. If you need to specify multiple proxies, you may do so by specifying additional entries. You may also narrow down matches using * and/or **, to match the path exactly or any subpath. To setup jest-enzyme with Create React App, follow the instructions for initializing your test environment to import jest-enzyme. Note that currently only version 2.x is compatible with Create React App. By default, the production build is a fully functional, offline-first Progressive Web App. All static site assets are cached so that your page loads fast on subsequent visits, regardless of network connectivity (such as 2G or 3G). Updates are downloaded in the background. Your app will work regardless of network state, even if offline. This means your users will be able to use your app at 10,000 feet and on the Subway. On mobile devices, your app can be added directly to the user's home screen, app icon and all. You can also re-engage users using web push notifications. This eliminates the need for the app store. The sw-precache-webpack-plugin is integrated into production configuration, and it will take care of generating a service worker file that will automatically precache all of your local assets and keep them up to date as you deploy updates. The service worker will use a cache-first strategy for handling all requests for local assets, including the initial HTML, ensuring that you web app is reliably fast, even on a slow or unreliable network. If you would prefer not to enable service workers prior to your initial production deployment, then remove the call to serviceWorkerRegistration.register() from src/index.js. If you had previously enabled service workers in your production deployment and have decided that you would like to disable them for all your existing users, you can swap out the call to serviceWorkerRegistration.register() in src/index.js with a call to serviceWorkerRegistration.unregister(). After the user visits a page that has serviceWorkerRegistration.unregister(), the service worker will be uninstalled. Service workers require HTTPS, although to facilitate local testing, that policy does not apply to localhost. If your production web server does not support HTTPS, then the service worker registration will fail, but the rest of your web app will remain functional. Service workers are not currently supported in all web browsers. Service worker registration won't be attempted on browsers that lack support. The service worker is only enabled in the production environment, e.g. the output of npm run build. It's recommended that you do not enable an offline-first service worker in a development environment, as it can lead to frustration when previously cached assets are used and do not include the latest changes you've made locally. If you need to test your offline-first service worker locally, build the application (using npm run build) and run a simple http server from your build directory. After running the build script, create-react-app will give instructions for one way to test your production build locally and the deployment instructions have instructions for using other methods. Be sure to always use an incognito window to avoid complications with your browser cache. If possible,configure your production environment to serve the generated service-worker.js with HTTP caching disabled. If that's not possible—GitHub Pages, for instance, does not allow you to change the default 10 minute HTTP cache lifetime—then be aware that if you visit your production site, and then revisit again before service-worker.js has expired from your HTTP cache, you'll continue to get the previously cached assets from the service worker. If you have an immediate need to view your updated production deployment, performing a shift-refresh will temporarily disable the service worker and retrieve all assets from the network. By default, the generated service worker file will not intercept or cache any cross-origin traffic, like HTTP API requests, images, or embeds loaded from a different domain. If you would like to use a runtime caching strategy for those requests, you can eject and then configure the runtimeCaching option in the SWPrecacheWebpackPlugin section of webpack.config.prod.js. The default configuration includes a web app manifest located at public/manifest.json, that you can customize with details specific to your web application. When a user adds a web app to their homescreen using Chrome or Firefox on Android, the metadata in manifest.json determines what icons, names, and branding colors to use when the web app is displayed. The Web App Manifest guide provides more context about what each field means, and how your customizations will affect your users' experience. On a production build, and in a browser that supports service workers, the service worker will automatically handle all navigation requests, like for /todos/42, by serving the cached copy of your index.html. This service worker navigation routing can be configured or disabled by ejecting and then modifying the navigateFallback and navigateFallbackWhitelist options of the SWPreachePlugin configuration. BROWSER ✅ ❌ By default, Create React App will open the default system browser, favoring Chrome on macOS. Specify a browser to override this behavior, or set it to none to disable it completely. If you need to customize the way the browser is launched, you can specify a node script instead. Any arguments passed to npm start will also be passed to this script, and the url where your app is served will be the last argument. Your script's file name must have the .js extension. Some editors like Vim and IntelliJ have a “safe write” feature that currently breaks the watcher. You will need to disable it. Follow the instructions in “Adjusting Your Text Editor”. If you use a Moment.js, you might notice that only the English locale is available by default. This is because the locale files are large, and you probably only need a subset of all the locales provided by Moment.js. To add a specific Moment.js locale to your bundle, you need to import it explicitly.